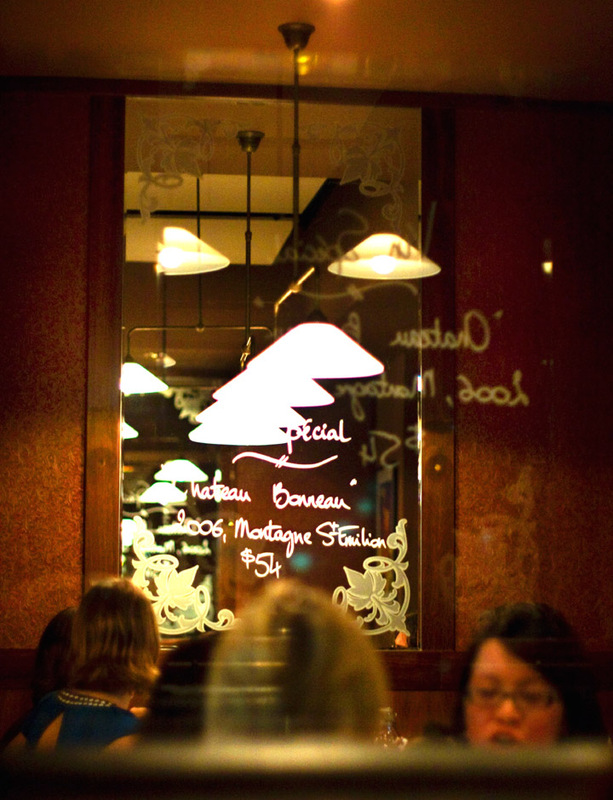 This first post will be about La Brasserie, an institution of Darlinghurst, gathering locals and Frenchies alike around classic French dishes, as well as charcuterie, imported and local cheeses and wines. La Brasserie has been an official sponsor of the French Film Festival for 3 years in a row, at the occasion of which, George Miller, director of Happy Feet, was awarded the prestigious French Award of the Order of the Arts and Letters at the restaurant a few weeks ago. It is at the occasion of our monthly Girls catch-up dinner with my friends Elodie and Julie that we set our eyes on La Brasserie, as it is conveniently located close to the CBD, reasonably priced and their menu really appeals to our French expatriate palate! We arrive at 7pm and Nick, the Floor Manager, welcomes us in the already busy restaurant. He leads us to an almost alcove-like table, around which hang heavy red curtains that at some stage the diner of our neighbouring table will draw over us (to block our continuous French banter?!). It feels intimate, even though we are at the heart of the room. The decor of a typical French brasserie makes us feel straight away at home: the all-French staff, the specials written on mirrors on the wall, the red velvet curtains, the leather banquettes and the old advertising posters of Vache Kiri, Perrier and Pernod, all contribute to bring an authentic touch. We order a bottle of Waitiri Creek Pinot Noir from Central Otago NZ ($54) and start drooling at the menu. 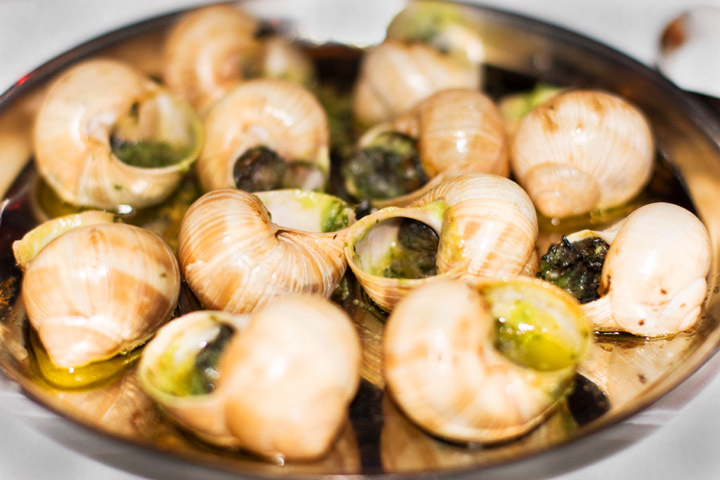 It takes the waiter approximately 3 seconds to twist my rubber arm and have me upgrade my entry from half a dozen to a dozen of Snails baked with garlic parsley butter & sliced baguette. My friend chooses a Twice-baked goat’s cheese soufflé with walnuts & frisée lettuce. 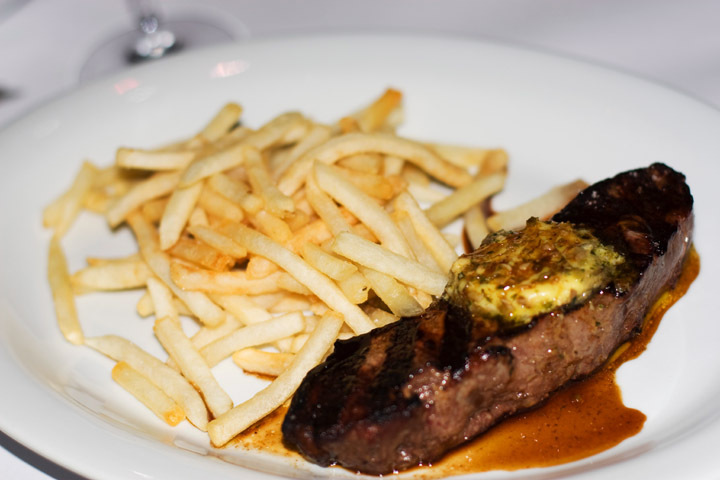 We don’t think too long either before ordering all three of us the Steak Frites with sauce café de Paris & French fries, which we have heard so much about from friends and reviews. The entries arrive shortly after, thanks to a prompt and friendly service, and the snails are all I wanted them to be: tender, not rubbery at all, with plenty of parsley, garlic and butter sauce to sponge with my bread. I could have easily have swallowed another dozen! 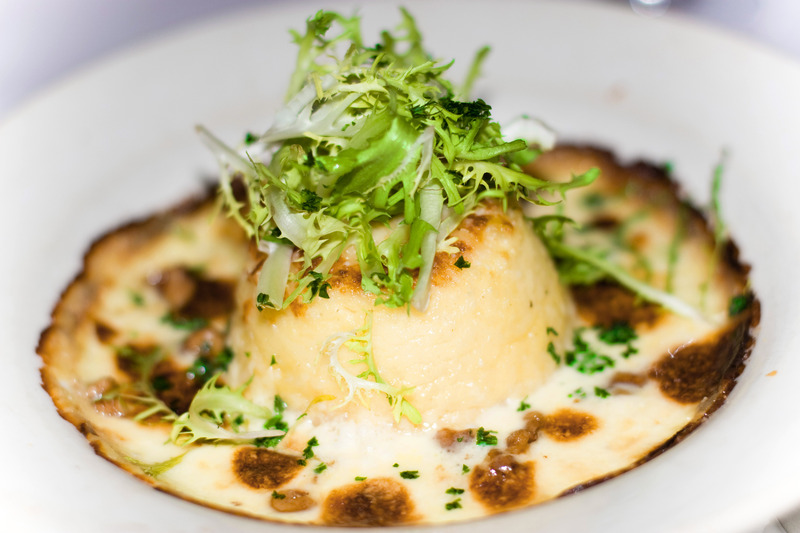 Elo’s Souffle is also very nice, fluffy, light and cheesy! The mains arrive also in a timely manner and not much can be heard at our table but groans and noises of contentment while we savour our nicely cooked steaks, juicy and tender! The girls can’t finish their plate, but I persist without too much difficulty and finish it. A dessert is however out of the question, even though I would have loved to try their Creme Brulee… I am just gonna have to go back! Philippe Valet, the “Patron” (Owner), comes say Hi to us and see if everything goes well, which is a nice attention. I decide on a Cognac, having recently discovered I like it, to prolong this lovely meal, but it is eventually time to face the outside world and the rainy night. The team waves us warm good-byes and we promise ourselves to return very soon. PS: Sorry in advance about the quality of the pictures, I promise I will get better at that! This entry was posted in Restaurants and tagged Darlinghurst, French. Bookmark the permalink. Your photos are great! Well done! Am dying to get to La Brasserie! Thank you! 😀 They’ll hopefully get better with time!